Good gracious, a topical post, from moi?! Heavens above! I promise I’ll try and make it good. Well, if you’re lucky. Now, as is completely typical of me, I have booked a week off work in the single week that there are severe weather warnings in my area (read: most of the country – there’s no avoiding this one. Like headlice really, your mum can do her best with that comb and the special shampoo, but you’re gonna get them anyway). So, I’ll probably be staying inside quite a lot. To avoid the storms, not because I have headlice. I don’t have headlice. My mum can vouch for me on that. On the plus side, staying indoors means more cooking, provided of course that the power doesn’t go out because then my electric hob is completely useless, as is my new microwave, my slow cooker and just about everything else in my kitchen. That’s not particularly what I wanted to talk about though – my topical discussion this week is more “food waste” focused. In light of the results that a well known “blue” supermarket chain has just announced, wasting 30,000 tonnes of food in 6 months isn’t considered to be as appalling as I’d like it to be. So, I have to ask the question, why? I don’t have to necessarily, but it seemed appropriate. When I was a child (oh yeah, this is going to be largely based on anecdotal family evidence, not science – I should probably mention that before we start) I didn’t like the brown bits that you sometimes get on bananas. I was cajoled into eating them through “but they’re sweeter than the rest of the banana”. Lies, said my tiny child brain. Total lies and nonsense. I made this clear to whatever authority figure was in charge at that point and was presumably told to stop whining and eat it anyway. We had a very low tolerance to waste, especially as my formative years were very largely influenced by my maternal grandmother who, having been around during the war years, was particularly vocal on the subject. Especially with my eyes being somewhat larger than my stomach and me wanting everything that everyone else got, despite the fact that they were all grown ups and about 3 times my size. I would like to point out, for the sake of family harmony, that my grandmother was very young during the war years and is still hugely glamorous and not at all ‘old’. Tangents aside, I find it very difficult to waste food and I think that there is definitely a cultural link to the rise in wasted food products. Our current consumer culture dictates that we ‘need’ the newest, flashiest items and nothing can be perceived as ‘past its best’ or it reflects badly on our social status. Unless of course, that item can be identified as ‘vintage’, in which case it’s even better. The problem? This attitude is spreading through our entire way of living, and there’s no such thing as a vintage carrot. Couple that with the pseudo-scientific belief that everything past its use-by date will kill you, and you’ve bred a culture that will happily engage in wastefulness. I don’t mean to be sanctimonious and what not, but when this ‘torrential weather’ hits us on Monday and the entirety of the UK is returned to the dark ages (if, of course, the forecasts are anywhere close to correct – I’ve got my shorts out just in case they’re as wrong as normal) we will all be unable to get to the supermarket! Did you see my soup? 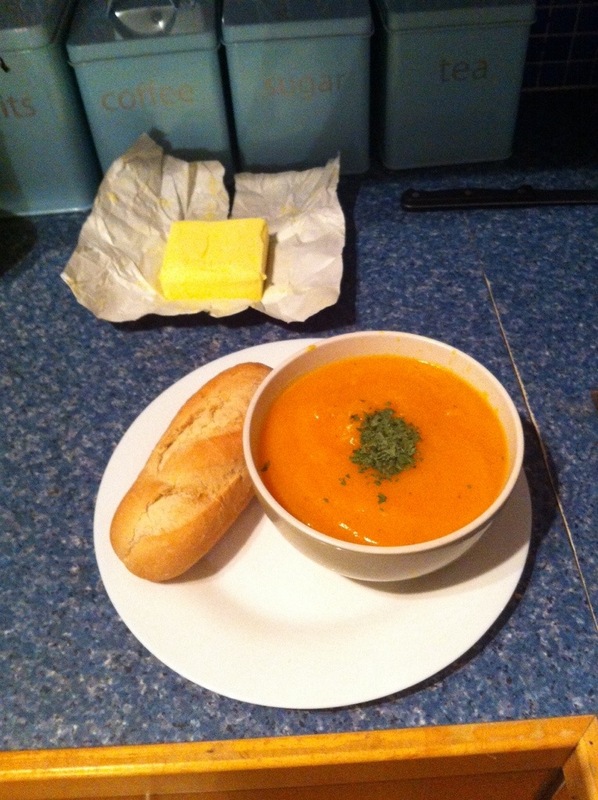 It was so lovely to come home to that soup last week, with a hot, crusty roll and some proper butter. Heaven. All it takes is 4 carrots, 3 onions, 4 parsnips and a swede or two. Boil ’em up until they’re soft, blend, season and voilà – comfort soup. The part you don’t know? All of that veg was going a bit soggy by the time I got around to using it, and someone else might have thrown in away. In fact, most people probably would. Not me though, mainly because I’m a sentimental old thing, and I genuinely feel bad for those veg if they aren’t used for their intended purpose. That’s right, I even sympathise with the things I’m going to eat. Earlier, I had a completely one sided conversation with the haddock fillets that are currently in my oven over whether I could salvage the spinach in the fridge. Turns out, I could. It was a little slimy, but I picked out the good bits and it’s baking away to create some kind of delicious Mornay based supper. So then – don’t just chuck things away. I think that’s where I was going with this. Make banana smoothie if bits of your bananas are brown. Make a soup to save your squishy veg – even if you freeze it to use later (watch out though, when those gusts of wind knock out every power station in the country on Monday, your freezer will defrost. Be prepared to eat everything, raw too, probably). Cut off the bad bits and use the rest, it actually makes you feel better. Well, it makes me feel better and I haven’t taken the moral high ground in ages, take from that what you will. In conclusion, then: the upcoming return to the dark ages will necessitate your reliance on food that is not perfect, use it wisely. Also, if we don’t return to the dark ages, try and use stuff up. It’ll probably save you some cash and, hey, if people think ‘thrift stores’ are cool now (thanks, Macklemore) maybe soon we can look forward to an adjustment in opinions about food and ways to not waste it (like freezing veg – not just peas either but all kinds of things!). I’m sorry if this sounds preachy – I promise a return to self-deprecating cookery tips in the near future. If you’re lucky. If not, it’s a different ecological topic every week ’til Christmas. Anthropology Graduate with a head full of nonsense and comic books. Season of soups without doubt – and it is so fun to experiment with ingredients – like this. Soup rescues everything that, as you say, might otherwise hit the bin liner. Or curry it! Hope you don’t end up being blown away – cue Dorothy ‘Oh Toto…I don’t think we’re in Andover anymore….’. Off to batten down all hatches! Stay safe!! Of course – we break up on the 12th. I am sure we can get you round at some point over the festive season or early in the New Year!